I also bit the bullet and installed the turbo I bought last summer. It's a bigger turbo than I was planning on getting, but I got a smaller turbine housing in hopes to get some spool back. I'm using a Tial MVS for boost control. Due to space constraints and the fact that I'm using the stock manifold, this is what I did for the wastegate. I don't have much time on the turbo yet, but I'm pretty pleased so far. It obviously doesn't spool like a 19t, but it's really not bad. I'm getting positive boost by 2000 rpm, and 20 psi by 3500. My 4.30:1 rear end probably helps with that. LH seems to want to over fuel, so I haven't gotten a bunch of clean 20 psi pulls. Usually by 20 psi and about 4500 rpm, it goes super richs and bogs. I suspect it's also pulling timing. Once I get the tuning sorted, I think this car is going to be a riot. Really nice looking update there Tyler! I was wondering how that bigger balancer would do. I might play with a few ideas on mine as well, seeing that it did make a difference. That should work just fine. Looks really good in terms of flow re-entry into the downpipe. The wastegate flow shouldn't interfere with the turbine outflow very much at all. Also great that you included a diverging nozzle at the turbine outlet - will help the turbine make more shaft power and helps keep your exhaust backpressure down. All your recent progress looks good man! Yeah, I'd say it was a worthwhile effort. My trans is definitely not silent now, but it's a lot better. It seemed to smooth everything out, like a slightly heavier flywheel, but different. Thanks! I haven't been able to really dial in the boost control yet, but I am wondering how low I'll be able to set it with this arrangement. It seems like it could creep a bit, since the wastegate isn't given priority. But like you said, it should be better for the turbine, and I'm going to want to run 20+ psi anyway. I think my next big project will have to be tuning related. Either go to MS, or at least try one of your wasted spark boards with LH for now. I get this high boost, high rpm over rich situation, and it bogs down or sputters. I was thinking it was just over fueling, but it just occured to me that it could be spark blowout, which could read rich on my wideband? 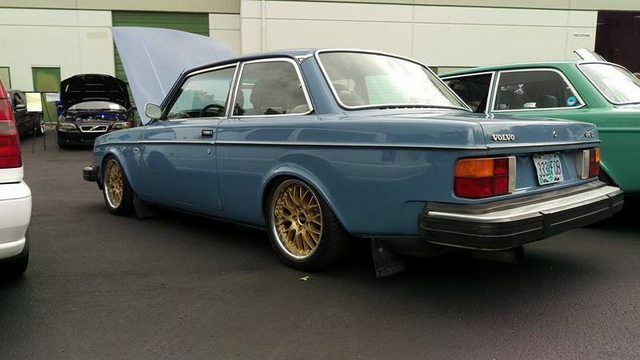 I've never had another Volvo, so it's weird for me when I see them slanted. It's so much better in terms of fitting turbo stuff. Wonder whether the engine slant was built in for pedestrian safety. I'd imagine it's to give room for longer runner intake manifolds and brake booster / strut tower clearance. The exhaust side (except for the turbos) is fairly compact. can you 'splain? I'm interested and I keep squinting at the pictures and can't spot what you're referring to. Reading through old Volvo literature recently I came across the explanation... engine was slanted to make room for K-jet bits on the intake side and the related intake manifold design(s) required to meet emissions. Sorry for the jargon. By diverging nozzle I'm just referring to the tapered tube at the turbine housing outlet, going up to his full downpipe diameter. Radial turbines generate shaft power via momentum transfer from the exhaust gas, but expansion ratio (inlet pressure/outlet pressure) plays an important part. By allowing the outlet flow to expand in a diverging nozzle you can reduce the expansion ratio needed to produce the required amount of shaft power at a given mass flow rate. Lower post-turbine pressure then results in lower pre-turbine exhaust backpressure. Helps improve engine VE reducing restriction, allows for more timing advance before the knock threshold, gets your exhaust manifold pressure down closer to intake manifold pressure; all good stuff. Uh.. yeah! I meant to put all that in my original post. Must have slipped my mind. Seriously though, thanks for sharing your turbo knowledge with us. No worries. I thought it was pretty interesting when I learned about the downpipe's potential affect on performance. Common knowledge is "the best turbo exhaust is no exhaust," which is generally true in that minimizing post-turbine restriction is beneficial. But of course there are always subtle details that can help or hurt. That's very informative. Thanks for explaining! Last edited by Harlard; 01-08-2019 at 08:31 PM..
AGP offers a T3 housings in .63, I think. I was just super scared of lag, so I went with the tiny .48. The .63 T3 housing has a 3" v-band outlet option, too. Just love a functional car with functional mods... this 140 is how it should be done. thanks for taking the time to explain it, learn something new every day! Hell, I'm running a .63 on my 2871R with no issues with lag whatsoever (especially with a good tune, cold temps, and E85...lol). Careful with comparing the same numerical A/R across different turbo frame sizes. A/R is just a ratio, and within a frame size there will be a family of several different A/Rs. But as you go up in turbine wheel diameter (from GT28 to T3) the "R" (centroid radius) of the housing scroll will grow and therefore the A (flow area) also has to get bigger to maintain the same numerical A/R. TL/DR: 0.63 A/R housing designed for a T3 turbine wheel (likely 65mm wheel inducer diameter) will flow more than a 0.63 A/R on a GT28 (54mm inducer diameter). Edit: I just looked up the S252 sx-e turbine specs; it has a 70mm inducer so the difference in housing flow would be even more pronounced. This build is so satisfying to look at. I don't have too much to update, other than to say I solved my high rpm/high boost misfire. It always seemed to coincide with a 10.0 reading on my AFR gauge, so I thought LH was just going rich enough under load to give me a rich misfire. It happened with the 19t at 18+ psi, and the s252 around 12+ psi. I don't know why I never thought about spark blowout, but that was the issue. My BPR7ES plugs were gapped at .030. Set them at .021 and the issue is completely gone. This turbo feels strong all the way to redline at 20 psi! Glad you found something so simple to fix the issue! Yeah I can't believe I never thought to do that before. It's been an issue since day one. Now I want to improve my ignition set up so I can run more than .021 and get some more power out of it without blow out. I know you wanna get away from lh2.4 but go the wasted spark route if you end up staying with it. I had to close my spark plug gap to somewhere around that with higher boost, even out of my 16t, before doing it. I've actually been messaging Duder about wasted spark on LH. It seems like a decent stop gap until I have more time to do MS, and I can keep using the wasted spark Bosch coil even after I ditch LH.